Claude William Fisher was born in Nottingham in 18842, the youngest of three children of George John (b. c1856, Nottingham) and Emma Fisher (b. c1856, Newport Pagnell, Buckinghamshire née Hayward)3. George John was a lace warehouseman who, by 1901, was living with his wife and two working sons at 15 Burton Street, Nottingham. Both of these sons were in the lace trade, George jnr was a machine builder and fitter and William as a draughtsman4. In 1905, Claude William married Hattie Holehouse and their first child, John, was born in 19075. By 1911, they had moved to live at 14 Charlton Avenue, Long Eaton, Derbyshire and Claude William continued to work as a lace draughtsman6. Their second child, Grenville, was born there later that year7. By the time that war came in August 1914, Claude William and his family had moved to Beeston, where they were living at 12 North Street, part of the Imperial Park Estate, an area favoured by the aspirational professional classes. Having now established a good job and a good home with a young family - a third child, Mavis Nora, was to be born in November 19158 - it is perhaps not surprising that he was not amongst those who enlisted so enthusiastically in the early months of the war. By the middle of 1915 however, the number of volunteers had dropped off and the relentless demand for more and more men at the front was not being met. In a attempt to boost numbers without invoking the unpopular option of conscription, the Government adopted a scheme devised by Lord Derby that became known as the 'Derby Scheme'. It encouraged men to voluntarily attest for service at a later date and, in the mean time, to be placed in an army reserve and released to everyday life until needed. Those in the reserve were categorised by age and marital status to be called on in a structured way. Crucially, the scheme promised that married men would not be called on until the pool of single men was exhausted. Despite active canvassing, the scheme did not produce the numbers required and, early in the following year, conscription was introduced. In the event, Claude William attested under the Derby Scheme and place in the Reserve on 8 December 1915 in Long Eaton, just days before the scheme was wound up9. Over 18 months later, on 27 June 1917, he was mobilised with the 4th Battalion Sherwood Foresters. After training, he was posted to France to join 17th Battalion Sherwood Foresters on 16 October 1917, just in time to take part in the Second Battle of Passchendaele. This would have been a terrible introduction to the horrors of the Western Front, fought in a quagmire of mud and with frequent rain - although better planning ultimately resulted in and overall Allied victory but, as ever, with terrible casualties. On 21st March, the German Army launched its Spring Offensive from the Hindenburg Line with the objective of ending the war before American troops and resources could tilt the balance towards the Allies. The objective was to smash through the Allied lines, push the British forces into the sea and to cut off their supply lines by seizing the ports. During the next few weeks the enemy attacks made worrying progress and, in the desperate fighting to limit the advance, there were heavy casualties before the offensive was eventually ran out of steam and was subdued. 17th Battalion, as part of 39th Division, took a full part during this critical period and, in late April was in action in the offensive's third phase, known as Operation Georgette which aimed to cut off the British Second Army at Ypres. Despite continuing difficulties in replacing diminished manpower, the attack was held once again. During a phase of this attack, know as the Battle of Kemmel, During the fighting, Private Fisher was wounded by gunshot to his back. After evacuation through the medical chain, he was returned to England for treatment and convalescence. But the manpower demands of the Western France were relentless, such that, as soon as he was fit again, he was returned to France on 14 August 1918, this time with 10th Battalion, Sherwood Foresters which was then about to be engaged in the 2nd Battle of Bapaume as part of 17th Division. This was the second phase of the Battle of Amiens, the British and Commonwealth attack that was to become the turning point of the First World War on the Western Front and the beginning of the Allies' Hundred Days Offensive during which the enemy was pushed back, but against relentless resistance. On 14 September, Private Fisher was promoted to Acting Lance-Corporal10. On 18th September, the battalion took part in what became known as the Battle of Epehy. This was an offensive against enemy forward outposts in front of the Hindenburg Line, Germany’s last line of defense on the Western Front. During its successful attack, the battalion took many prisoners, including a complete garrison11. Its own casualties were limited to just 30 other ranks but, sadly, Lance Corporal Fisher was one of that number killed on that day. Lance Corporal Fisher's body was never identified12 and he is commemorated on the Vis-en-Artois Memorial to the Missing which stands as the back drop to the Vis-en-Artois British Cemetery, situated to the west of Haucourt on the Arras/Cambrai road, about 10 kilometres south-east of Arras. The Memorial bears the names of over 9,000 men who fell in the period from 8 August 1918 to the date of the Armistice in the Advance to Victory in Picardy and Artois, between the Somme and Loos, and who have no known grave. They belonged to the forces of Great Britain and Ireland and South Africa while the Canadian, Australian and New Zealand forces are commemorated on other memorials to the missing. The Memorial consists of a screen wall in three parts. The middle part of the screen wall is concave and carries stone panels on which names are carved. It is 26 feet high flanked by pylons 70 feet high. 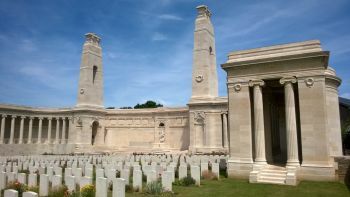 The Stone of Remembrance stands exactly between the pylons and behind it, in the middle of the screen, is a group in relief representing St George and the Dragon. The flanking parts of the screen wall are also curved and carry stone panels carved with names. Each of them forms the back of a roofed colonnade and, at the far end of each, is a small building13. Lance Corporal Fisher was posthumously awarded the British War Medal and the Victory Medal14. His financial effects of £6 16s 4d, which included his War Gratuity of £6 10s, were paid to his widow as his sole legatee, on 29 December 191815. Hattie, his widow, continued to live in Beeston for most of her life, for some time at 24 Evelyn Street with her married daughter's family. She appears to have died in Loughborough in 1967, aged 85.15. 2His birth was registered in Nottingham Registration District in Q1/1884 (Ref 7b 425). Claude William's siblings were George E (b. c1881) and Nora Kate (b. c1882). 5They married in Sneinton, Nottingham on 23 April 1905. Their son John was born in Nottingham on 26 February 1907 (Claude William's Army Service Record). 6Long Eaton, Derbyshire: 1911 Census, Piece 20837 RD434 SD4 ED16 Schedule 135. 7Their son Grenville was born in Long Eaton on 15 September 1911 (Claude William's Army Service Record). 12His death was not declared as presumed to have occurred on 18th September 1918 until a year later. Until that date, the family clung to the hope that he had somehow survived. Poignantly, when his son John joined the Boys Brigade on 28 September 1918 (as 'Jack Fisher'), he stated that he had both a mother and father alive. 14Details from Claude William's Medal Card and his Medal Roll entry - available on ancestry.com. 15Details from his entry in the Army Register of Soldiers' Effects, 1901-1929 - available on ancestry.com.